6th Paper: Managing retirement income into very old ages. 5th Paper: A 3D retirement model based on actual ages. 4th Paper: What to do when markets go down. 3rd Paper: Market returns sequences during retirement. 2nd Paper: How changing your spending helps retirement income. If you don't know where you are going, any road will take you there." Larry's planning strategy, with you, is to integrate all of the above processes targeted specifically towards your goals. "It is more about process than it is about product." How is Larry’s retirement planning different for you? Larry’s focus is on both phases of retirement planning. He provides you with your single portfolio number that you should save towards during your accumulation years. What is unique is that Larry does retirement planning in reverse by using the same distribution methodology, to calculate pre-retiree’s numbers, that he uses for managing retiree’s actual retirement income distributions during their retirement years. Most other companies or planners calculate the retirement number under one method for accumulation years, and then switch to a different method for distribution years. Additionally, Larry evaluates future phases of retirement (survivor phase &/or estate planning phase) through a balance sheet approach where your assets and liabilities count too. Pensions and/or Social Security are important puzzle pieces to evaluate and optimize as well. Finally, Larry does not use rules of thumb. Instead, he uses your standard of living as the benchmark to measure success (rather than impersonal market indexes or returns), since people wish to retain their standard of living (Larry calls it your Standard of Individual Living (SOIL) in his book Wealth Odyssey). The Hour Glass above - represents the conversion of your Human Capital that is derived from your working years, into the Financial Capital that could support your Standard of Individual Living during your retirement years. Having a retirement accumulation plan is not the same as having a retirement distribution plan. These two phases of retirement are opposites and are often confused by the generic term of retirement planning. Do you have a retirement distribution strategy? Has it been coordinated with your accumulation plan if you are not yet retired? There is more to this than just investing. 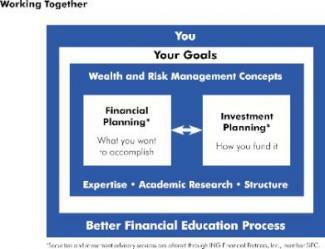 The Better Financial Education Process shows how we may work together to help you pursue your goals. An important part of the process is self discovery about your unique situation. That’s hard to do without an experienced, caring guide who can lead you through a financial planning process1 originally developed by the CFP® Board of Standards and designed to help you determine what you want to do. Financial plans developed through a defined process add to your independence, qualify of life, and piece of mind. The next step is Investment Planning, where you efficiently align what you have with your goals and financial plan. Drawing on years of research and real-life experience, we simplify the complexities of trying to prioritize multiple financial planning issues. We seek to empower you with a clear understanding of your financial choices and what they mean for all your individual goals as you build upon, and evaluate potential risks to, your wealth and goals. Your guided journey through the process is what helps to crystallize potential solutions to the issues that are on your mind today. Concerned about making your money last throughout your lifetime? This Retirement Distribution Process illustrates how you may plan, transition, and live on your resources during retirement, where income for your living expenses will come from your accumulated wealth instead of a paycheck. This process is based on withdrawal rate research2 which goes beyond simply investing and hoping for the best. There are benchmarks that will help you identify and evaluate options and choices as your life and markets change during your retirement years. Larry’s methodology views the retirement challenge as simply a change in direction of which way your money flows when you transition, from working and accumulation years, to retirement and distribution years. This means that your "number" for the amount you need to save for retirement is consistent between both phases. Larry's clients do not need to change their plan between theses phases as they transition since retirement is for a lifetime, rather than simply an event. What is your retirement number? Larry's Retirement Decision Rules help you focus on preparation rather than prediction. What decision do you make; how do you know when to make it; what do you once you've made it; and when do you go through this decision process to change things back again? The Retirement Decision Rules form a supplement to your Investment Policy Statement (IPS). 1 click here to link to Let's Make a Plan by the Board of Standards, for a look at the Financial Planning Process. 2 Withdrawal rate research is published in many industry journals to include Journal of Financial Planning, www.fpajournal.org/. Investor behavior determines your long run results according to the latest DALBAR study, where the average fund investor does not achieve the returns available to them from the broader markets. Structured Investing process, provides a methodology that may help you achieve broader market results to accomplish your goals. Structured Investing is more about process than about product. Implementation of the process is through an evidence-based investing approach. 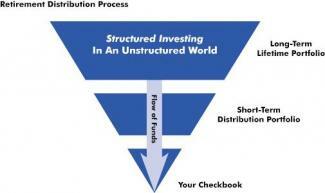 Learn more about the Structured Investing process. More presentations and videos on the philosophy and process. 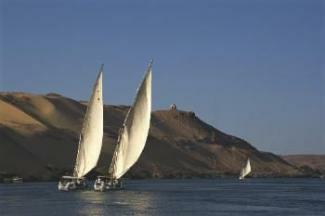 Structured Investing helps us set the sails since no one can control the wind. Investing by itself is like being on a raft. A plan provides the rudder. Your goals provide the destination to which you set your sails. All four of the above processes are purposefully designed to integrate together in order to form a smooth transition through the various phases of your life. A common error people make is to measure one investment against another. Investment results will differ as a result of different asset class mixtures which perform differently at different times. This is like measuring progress on a journey by the distance traveled - but what is the destination? Where are you trying to get to so fast? Is it even in the correct direction? A more appropriate measure of one's investments is to evaluate how they, in combination, are projected to achieve your goal. Progress can be measured more appropriately when your destination has also been considered. *Note - Tech tip: If a second window does not pop up and open, you may have a pop up blocker active. You may bypass a pop up blocker, anytime case by case, by holding down the shift key while clicking the link or icon you wish to open. There are two ways that I am compensated for my advice and services. You can choose one or both. First compensation method: I receive an annual fee, paid quarterly, based on the value of the assets I manage for you. Fees start at a maximum of 1.2% and go down to 0.4%, based on the value of your portfolio. My 1.0% crossover point is $750,000 where amounts above this have less than a 1.0% fee. This method is appropriate for clients who want comprehensive advice and investment services, such as ongoing planning and portfolio management, automatic rebalancing, and expanded reporting, etc.. Working together this way saves you from having to do everything yourself and helps you stay focused and on track, as well as avoid a 4% to 7% cost due to poor market timing. Second compensation method: A consulting arrangement, billed by the project or on an hourly basis at $170 per hour. This method is appropriate for clients who want comprehensive advice in specific planning areas only while you are then free to implement the investment suggestions anywhere you choose as well as you would be responsible for managing the portfolio on your own without expanded visibility and reporting. We will have a thorough discussion to determine which compensation method is best for your situation. After we first meet, you will receive a complete written agreement designed for either method above as well as my Form ADV Part 2 and privacy notices that describe how we may work together. I am an independent Registered Investment Adviser and do not sell products for any company; you invest directly and retain discretionary control over your money. I am also a member of National Association of Personal Financial Advisers (NAPFA), a national association of Fee-only advisers. Please note: All fees, charges and expenses are detailed and disclosed through a written fee agreement prior to your becoming a client. Additional details are found in our Form ADV II, which may be downloaded here. Additional information may be found through my answers to NAPFA's Comprehensive Financial Advisor Diagnostic by clicking on the .pdf document below (here's a blank diagnostic to provide to other advisers you may be considering for their written input as well). Fundamental difference between an investment adviser, and those who are not investment advisers, by registration and regulation. I’m registered for investment advice under the Investment Advisers Act of 1940, and as you can see from the above, I am process oriented; I am NOT registered for investment sales (product oriented) under the Securities Exchange Act of 1934 which governs licensing of brokers and dealers (who may work as fee-based (commissions and/or fees). I have over 22 years’ experience working for people in various areas of their financial lives and am a fee-only NAPFA adviser and a fiduciary to you. I do work as a fiduciary with you - please see the video about the difference by clicking on "fiduciary." © 2019 Better Financial Education All rights reserved.